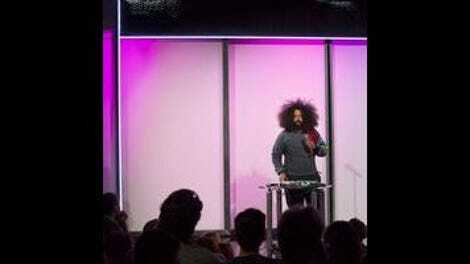 A Reggie Watts stand-up special is like a TED Talk by a mad scientist. (Watts has actually done a TED Talk, leaving the audience there as puzzled as it was entertained.) With his enormous puff of waving, unruly hair, non sequiturs and digressions, voices and accents, and elaborately bizarre musical segments, Watts gives the impression that his performance is either a deliberate, rambling put-on or communication on a plane we’re only able to comprehend in snatches. At his best, Watts does both, his experimental comic premises cohering into something like improbable (and funny) profundity. Spatial, his new Netflix special, is signature Watts, meaning it’s alternately exhilarating, silly, exhausting, and transcendent. Coming onstage as a Darth Vader-esque cloaked figure, Watts sonorously tells his audience of a vast, confusing interstellar conflict before reassuring them, “The vestibule has been opened and all of us continue to exist as if nothing will occur.” He then loses his train of thought while trying to come up with the name of their mortal enemies. Announcing that they will next be addressed by an esteemed ambassador, he drifts offstage, his cloak revealing the unitard-clad dancer hiding underneath, who gyrates to Spatial’s theme music. Welcome to a Reggie Watts show. Watts’ style can become trying in the initial perception of randomness; too much unmoored chaos gets tiresome. Slipping into a stereotypically “on” stand-up persona, he starts bits about the South and guns before spinning off into nonsensical warnings like, “When you buy it and you put it somewhere, it’s probably gonna be there when you look at it again.” When Watts introduces clips of the so-called legendary TV show he’s associated with, the “improvised in front of a live audience” Crowe’s Nest, the resulting segments (starring Watts and comedians Kate Berlant and Rory Scovel as on-edge housemates) seem like just an interminable parody of bad improv. Only as the bit recurs do echoes of Watts’ stream-of-consciousness monologues start to spark off of the faux show’s theme of the impossibility of communication and connection. If, as Watts states as part of one digression, “the internet depersonalizes and yet makes us vulnerable and super-personalized towards our lives, towards others, and towards the way that we relate to geometric realities,” then his seemingly rambling stabs at expressing his ideas become part of a woozy, intoxicating reality of their own. Watts’ performances are anchored by musical numbers, and Spatial finds him plying his signature blend of absurdity and virtuosity. With his electronic consoles and microphone, Watts starts a song with a syncopated sound, only for his voice to unexpectedly double, triple, and so on. The effect is that of the first musical idea lifting off on its own while Watts moves on, the looping of old and new echoing together, layering more and more until the song reaches a delirious, improbably unified symphony of weirdness. At one point, he calls up a volunteer (a ringer, in fact) from the crowd, and the two do a masterful tap-dancing duel, Watts incorporating her tapping with his vocal imitations thereof. In one song, Watts approximates various singing and rapping styles in manner but without words, the swooning, throbbing abstraction anchored by his baffling repetition of the name of a particular cold medicine. (It would be an interesting world where a Watts song becomes a jingle.) The same conceit informs a flashback sequence where Reggie imagines himself fronting a ’90s grunge band, his growling vocals no less authentic for how little sense they make. It’s in his final number that Spatial ascends to something like genius. Watts masterfully uses his instrument (and instruments) to delve into deeper and weirder aspects of human relationships in a peppy, Bobby McFerrin-like love song. While its message is essentially the same as “Don’t Worry, Be Happy,” Watts takes a dizzying tour through the philosophical and evolutionary underpinnings of love and desire with such nimble-tongued authority (and deploys his sneakily amazing pipes while doing so) that lyrics like “There’s no order, we’re all improvising, and any way that makes you happy is truly the way that you should survive” land with awesome clarity and power. It’s as mysterious and beautiful a creation as Watts has ever made. That he segues immediately into a silly striptease and a concluding dance party (complete with Watts doing a Don Cornelius impression) only reinforces how uncategorizable and fascinating a performer he is.